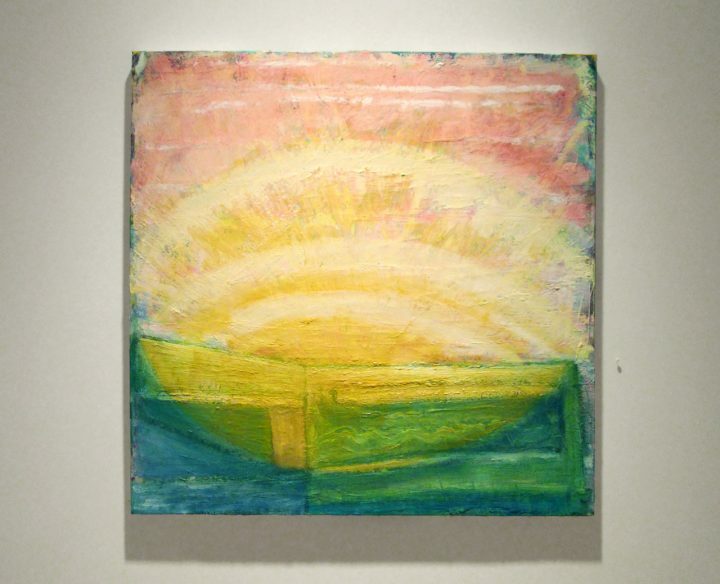 Gregory Amenoff’s paintings mix influences with knowing exuberance. 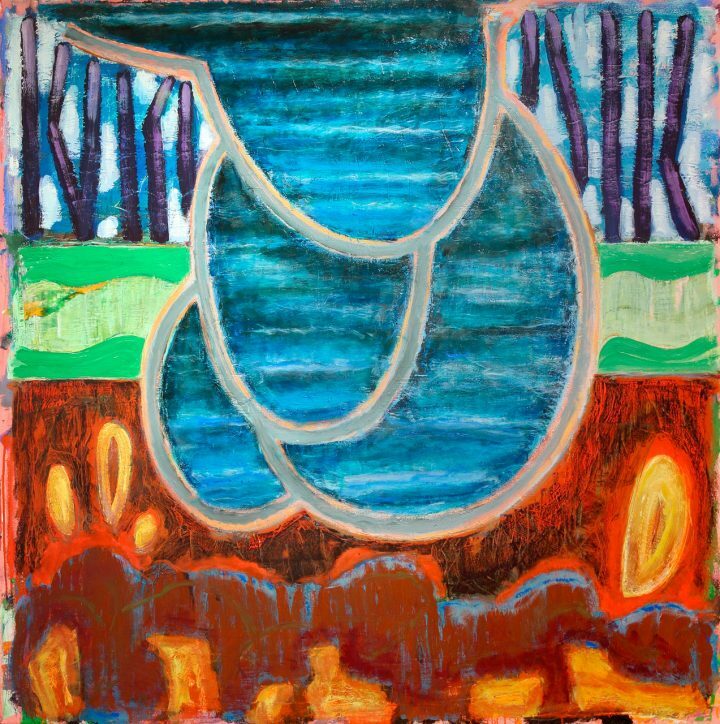 With their heightened colors and abstracted, organic forms, Gregory Amenoff’s paintings hark back to the dawn of American Modernism — back to Arthur Dove and Marsden Hartley, who similarly sought the lyrical and transcendental in earthbound motifs. Some of Amenoff’s paintings, especially the larger ones, also appear to draw on a different source: the allover scale and textures of Abstract Expressionism. Currently on view at Alexandre Gallery, 14 of his recent works mix these influences with knowing exuberance. The results range from the celebratory to the moody to the playful. While the natural landscape, exotic and enveloping, underpins all of Amenoff’s scenes, they depart from boiler-plate realism by several routes. A number of especially romantic paintings are notable for their brushy, atmospheric depths; they depict more-or-less real objects overwhelmed by preternatural forces. In a work dominated by bluish blacks, a lone steel lattice tower — one of the very few man-made artifacts in these paintings — weathers a wintry storm at sea, distantly echoing J.M.W. Turner’s late paintings of shipwrecks. Another tower aggressively fills the dimensions of a second painting, even as it melts into the background blaze of yellow. In a third, solar beams radiate over a hulking warehouse or office building, practically dissolving its outlines. The three smallest works in the exhibition, each 12 inches or so across, depict fantastically distorted scenes, with jagged bands of earth and sky arcing around dark centers. In these, the artist’s twisted rendering of space sets the urgent tone, but it’s their titles — such as “Grotto II (Ornans)” — that reveal their inspiration: one of the mysterious grotto paintings by Courbet, the master from Ornans, celebrated for his frank and earthy appetites. In his largest canvases, which are up to six feet tall, Amenoff shifts gears again. He abandons distinct divisions between land and sky for kaleidoscopic mosaics of suggestive textures and shifting viewpoints. In “Flood” (2015), overlapping, blue-green streaked pools descend from the canvas’s upper edge, like an aerial view of rice paddies; other elements, however, are presented at eye level, defying conventions of gravity and space. These include a tier of marching strands that might be sun-dappled tree trunks and rounding red and yellow forms that populate a desert-like zone; in between, elegant curls of green evoke a rippling stream. Amenoff’s keen colors vitalize the movements between these elements, imparting an abrupt depth to the pools of water and a rambling spaciousness to the reds of the “desert.” In the other large paintings, the descending, looping forms reappear in varying guises, such as chains of plant or animal cells, surrounded by structures redolent of veins, leaves, and trees. Experienced together, the paintings conjure a vibrant, eclectic mysticism, based in fertile allusions and buoyant color and texture. They exude an enthusiasm for historical precedents and their pictorial inventions. The strongest, such as “Flood,” reveal even more: the mysterious, accumulating force of colors themselves, in charged, top-to-bottom orderings of sensations reminiscent of Hartley’s soberly exultant paintings. How to combine the primal directness of Abstract Expressionism with the diligent mysticism of Hartley? There will never be a recipe, but Amenoff is right: you might find the roots of both of these, and more, in Courbet. 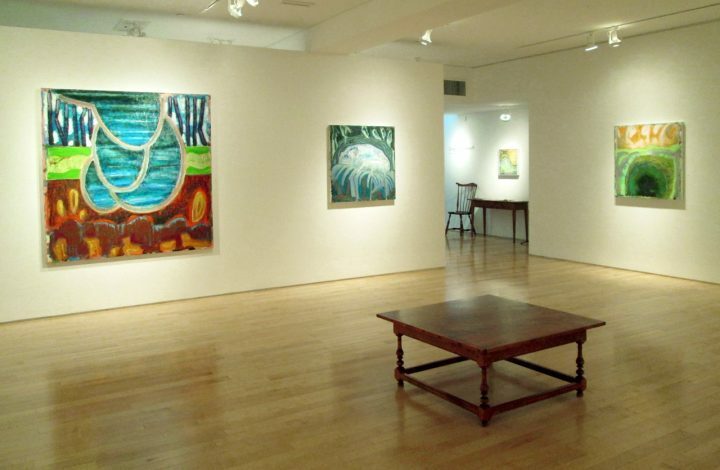 Gregory Amenoff: New Paintings continues at Alexandre Gallery (724 Fifth Avenue, Midtown, Manhattan) through November 5.